TRAP DESCRIPTION: 5" Wide x 5" Tall x 30" Long. Repeating Trap with rear sliding door. 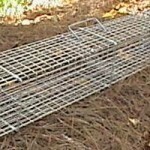 This is a unique trap in that it can catch many rats or other small rodents with just one set. Built with 1/2" x 1" mesh wire, it features two one way doors and one sliding door. Animals enter the trap by passing through the first one way door. This brings them to the front half of the cage. Once in this section, the animal has only one way to go and that would be through the second one way door. Once it passes this second door, it will be in the second half of the trap where it will remain until you want to release it. The third or last door is on the back side of the second half and allows the user to easily slide it open to release trapped animals. This trap can hold many squirrels, chipmunks or rats. They will tend to collect in the back section of the trap which makes for an easy release with it's rear sliding door. WHERE TO USE IT: In and around businesses and homes away from pets and children. Although not dangerous to pets and children, keeping it out of their way insures you'll get good results. Use it where the most activity is found which could be in the yard, a tree, around a bird feeder or on a deck or roof top. Remember, your first choice of trap placement should always be where they are feeding.